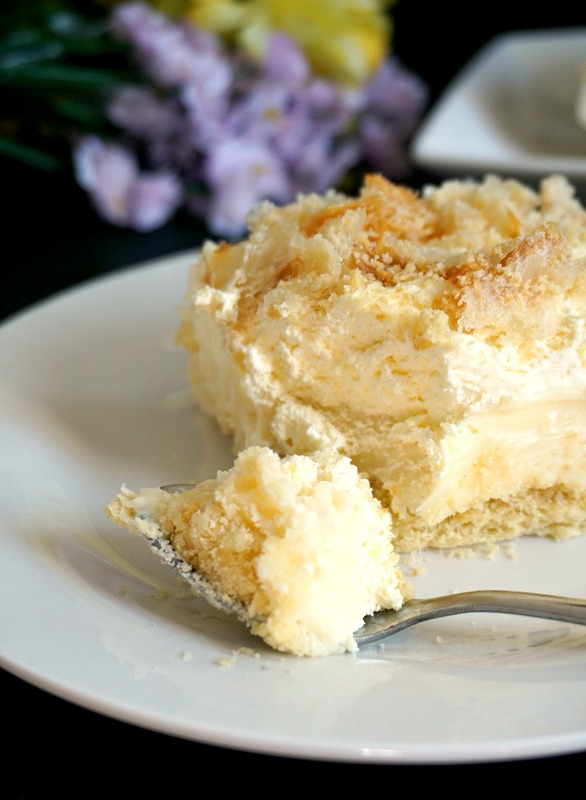 Cremeschnitte, a fabulous dessert with a flaky puff pastry base, topped with a rich vanilla crème pâtissière and silky whipped cream and pastry flakes. I’m very happy to be taking part in Lin’s February Cake Challenge called “Cakes we have to try Feb!” . Lin is the amazing food blogger behind Lin’s Recipes, check her blog for some yummy recipes. There were so many fantastic recipes to choose from and l gladly picked Cremeschnitte. The judges for this challenge are Suzanne and Jhuls. 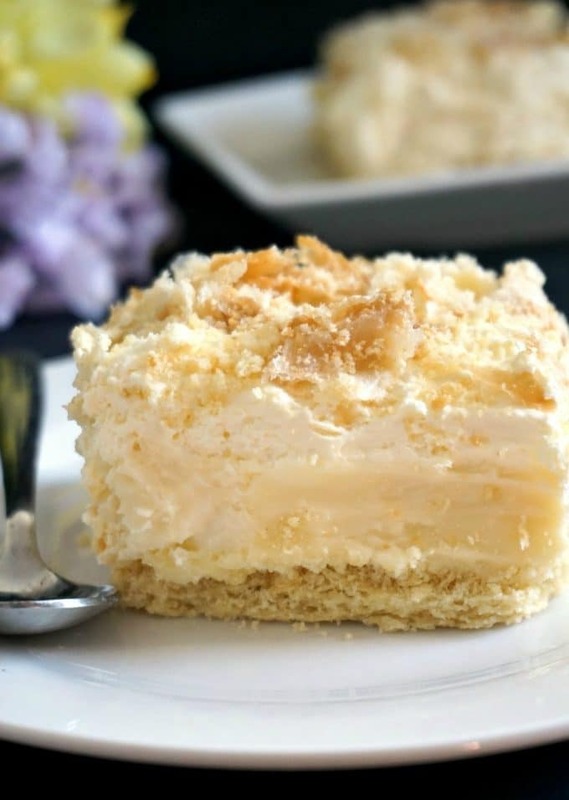 Cremeschnitte is a very popular dessert in Europe and it is translated as Cream Slices. It is much loved in Romania as well and l’ve loved it ever since l was a child, and we call it Cremșnit . My mum has made it countless times, but l must say that this is my very first try at making it. This desert is sheer pleasure, so creamy and sweet. There are probably many variations of this Cremeschnitte, but my version is a lot simpler. No need to make the base from scratch, puff pastry works just fine. 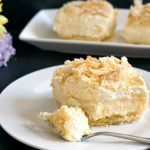 The base is made of rolled puff pastry, which is baked, then once it’s cooled down, it’s topped with vanilla cream, whipping cream and sprinkled with puff pastry flakes. I’ve got my inspiration from mum’s old recipe notebook, she has some fantastic dessert recipes, many written years and years ago. Such a treasure these recipe notebooks. I know that nowadays it is a lot easier to just store the information on a device or just google a recipe when we need it, but there will never be the same feeling as when you open an old recipe notebook. The simple things in life! The internet can never compete with these old books, and the joy of reading them after many years. How to make vanilla cream for cakes? What l love about the vanilla cream is how easy it can be made. I used it before for my cream puffs, without the egg yolks though. The egg yolks give a cream a pale yellow colour, as opposed to a whiter one if not used, but with or without egg yolk recipe works perfectly fine. You really need not spend money on a rubbish powder pudding, when you can make it at home with just a few ingredients you no doubt have in the kitchen on a daily basis. It tastes amazing, it’s rich, yet way healthier than those sachets of calories you buy in stores. Cremeschnitte is actually a super easy dessert, despite appearances, l managed to make it while my girls were asleep, and finished way before their nap time was over. And trust me, their nap is ridiculously short. Do try this yumminess, it’s heaven! If you’ve tried my CREMESCHNITTE RECIPE or any other recipe on the blog then don’t forget to rate the recipe and let me know how you got on in the comments below, I love hearing from you! You can also FOLLOW ME on FACEBOOK, and PINTEREST to see more delicious food and what I’m getting up to. 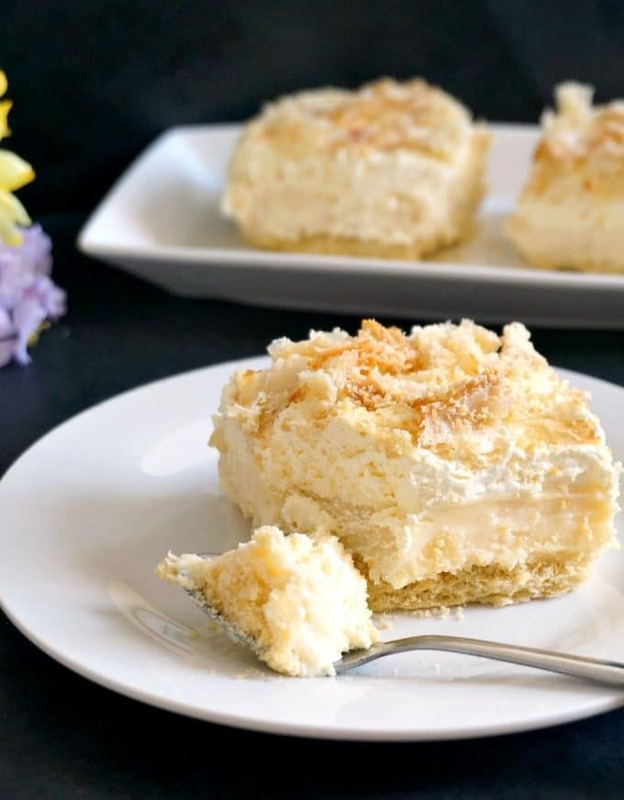 Cremeschnitte recipe, a fabulous dessert with a flaky puff pastry base, topped with a rich vanilla crème pâtissière and silky whipped cream and pastry flakes. Pour 250 ml of milk in a jug and add the corn flour. If you do not have corn flour, plain flour can be used instead. Add the other 250 ml of milk to a pan and simmer over a low heat for 1 minute, then add the milk and corn flour mixture and whisk well. Add the caster sugar, 2 tbsp vanilla sugar and egg yolks and continue to whisk until the cream thickens. Remove from the heat and add the butter cut into small cubes. Mix well until the butter is fully incorporated and set aside to cool completely. This cream is the famous Crème pâtissière and can be used it lots of other cakes or tarts. Pour the whipping cream in a large bowl together with the other 2 tsp of vanilla sugar and beat it with an electric mixer until it forms stiff peaks. Place the ready rolled puff pastry on the back of a baking tray, prick it with a fork in a few places, and pop it in the oven for about 15 minutes or until golden brown. Cut the puff pastry in half. Place one half on a large plate and top it first with the cream, then with the whipped cream. Crush the other half of the puff pastry and use the flakes to sprinkle over the cake. Refrigerate for at least 4 hours, ideally overnight before slicing the cake. The recipe has been updated with more text and more photos. Thanks, Lynn! I enjoyed making it ? Thank you, Lina! Glad you like it! ? Simple but beautiful!! Sounds perfect with a coffee! Looks delicious! Love that you got the recipe from your mom’s notebook… those family recipes are the best! I was using my Mom’s recipe of brownies before from a torn white paper she used to compile before. I could relate with you regarding the feeling. I am glad that you used your Mom’s recipe. These cream slices sound incredibly divine. I just love the combination of the puff pastry and the cream – both the flakiness and creaminess. Thank you, Jhuls! I really enjoyed the challenge! Thank you very much for your lovely comment, very nice of you! 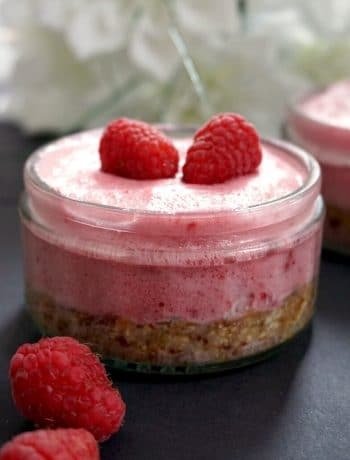 I really love this dessert, and it is delicious and easy to make. ? Love the use of ready rolled puff pastry. They come in handly. I always have them in my freezer too. Wonderful cream slices.. Creamy and rich.. Absolutely beautiful recipe, They look heavenly. Hi Marie! Thank you for your comment. I think in the UK it is more commonly called cornflour, but in others it is reffered to as cornstarch. It is in fact the same thing, so you can use what you have. I hope you like the recipe. Lol, I’m Daniela and I’m from Romania too. Except in the USA. <3 this recipe, and thank you so much! I will check back to see what you're cooking now and then. My heart melted when I saw the ingredient "Vanilla Sugar" because in the USA we have to buy that at the Asian market. I've been getting all my coffee drinking friends addicted to using that in their coffee. Hi Daniela 😊 I’m glad you liked the cremeschnitte recipe, it’s one of my favourite. I know what you mean, when l moved to the UK, l was so happy to discover a Romanian shop with products l love. Where l live now l can find some Romanian goodies at a local Polish shop, so l always stock up on vanilla sugar and other baking stuff. Hope you’ll like the other recipes, l tend to post a mixture of Romanian and international dishes. This dessert looks and sounds awesome! I just have one question. How much vanilla sugar is in a sachet? I make my own. I live in the United States and have never seen these sachets here. Thanks for sharing one of your moms recipes. Cherished family recipes are the best! The wonderful memories make every recipe special, and handing them down to your kids is a sweet memory for everyone. Thank you for your comment! Sorry for the confusion, these sachets must be easily found in EU shops only. Each sachet has about 2 teaspoons of vanilla sugar, but you can add more or less, to your taste. agree, these childhood memories are the best, they stick with us forever. What size of pan are you using for your puff pastry? And on the back of a baking tray…explain? Is that a standard package in EU as well as the US for the puff pastry? 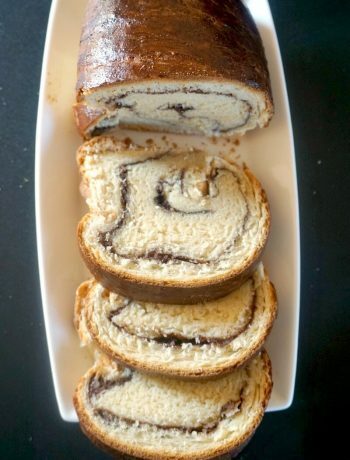 This looks amazingly yummy and I want to try it, but I want to make sure I understand it so I don’t mess up the recipe. I actually found Cremeschnitte mentioned in a book I am reading(‘Truly Madly Guilty’), and had to google it!! Thank you for your comment! I am not sure if you get the same size in the US, in the UK it’s usually 35×22.5 cm, that would be about 12×9 inches I believe. If you get slightly different size, just adjust the amount of filling accordingly. I chose to turn the baking tray (which has similiar size) upside down, and bake the puff pastry sheet there, just to make sure it’s even, but of course, it can also be baked normally in the baking tray. 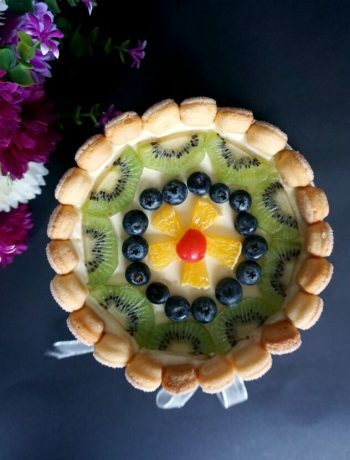 It’s a lovely dessert, light and refreshing, it’s really tasty cold from the fridge. I hope you’ll like it! Hello! Thank you for your comment! Sorry that the instructions were not clear, l have just updated them now. I forgot to add that the other 2 sachets of vanilla sugar are added to the whipped cream and beaten together. I hope this helps! I have already made the cake and I put the vanilla sugar in the cream. Today I will make it once more, but I will adjust the quantities for a little bit more cream, for 600 ml milk. Thank you again, it’s delicious and very easy to do! I’d love to make this, but I’m confused about the vanilla sachets? I’m unfamiliar with what this is, since I don’t think we have anything like that here. What would be the American equivalent? Thank you for contacting me! I have updated the recipe now, you can use 4 teaspoons of vanilla sugar, if you have, if not, just use vanilla extract, about a teaspoon. The vanilla sugar is for extra flavour, but it can left out. Larger grocery stores in the United States often have Vanilla Sugar Packets in the International section, usually in the German or European area. The brand is Dr Oetker Vanilla Sugar. It is also readily available on the internet. It is quite easy to make vanilla sugar by burying a vanilla bean in granulated or confectioner’s (powdered or icing sugar) sugar in a covered glass jar and leaving it for several weeks, shaking occasionally. You can add more sugar to the jar as you use it. That’s a great idea about making your own vanilla sugar, I will defintiely give it a try. Thank you! I would love to try this, but had trouble converting into US MEASUREMENTS. Can anyone help. I came up with 3/4 cups corn flour, 1/3 cup caster sugar 3 1/2 Tbs butter, & need to know how much whopping cream thanking you in advance. Hi Judy! Thank you for your comment! Under ingredients, there is Metric and US Customary. If you click on the US Customary, you get the ingredients in cups and ounces. It’s 1 1/4 cups whipping cream. I hope this helps.